Devices combine proven security and manageability customers rely on from Microsoft with Bluebird’s enterprise mobility expertise. Bluebird, a global provider offering full range of enterprise mobile device including data capture, payment and business tablet and handheld devices, today announced the availability of its flagship model, BM180 / BP30. These devices, built on the Microsoft Windows Embedded 8 Handheld platform, aim to be the best in the data capture and payment market place. Windows Embedded 8 Handheld is the next generation of Microsoft’s leading platform for line-of-business handheld devices. This means that end-users will gain enterprise-grade security and manageability, along with full Windows Phone 8 application compatibility, allowing businesses to leverage Microsoft’s enterprise-ready applications such as Dynamics AX, Lync and Office Mobile. Retailers are attempting to manage their stores in the most efficient way through the integration of voice and data communications into one single device. The use of Mobile POS terminals has significantly decreased the waiting time at the checkout lines. Bluebird has proactively addressed this changing environment, starting with their enterprise BM series mobile computer in 2004. Building on this market experience, Bluebird is launching the BM180 / BP30, the first Windows Embedded 8 Handheld devices to be available. With Windows Embedded 8 Handheld, enterprise users gain development productivity when creating business apps using common application programming interfaces (APIs) to access integrated peripherals in handheld devices. The same APIs are available in Windows Embedded 8 Standard and Windows Embedded 8 Industry platforms, making it easy to deliver an application on these industry specific handheld devices and then bring that application to fixed point of sale terminals, digital signage, kiosk and other embedded devices. As well as their Windows based Business tablet – BP80, Bluebird is launching its flagship model, BM180 / BP30, and both are scheduled to be purchased by several major retailers across the U.S. Although these products are made for enterprise customers, both products offer the most user-friendly features such as the interface, screen size, slim design and compact form factor. With these products, many more will recognize the prime quality of a Windows solution. Bluebird is a global provider offering full range of enterprise mobile device including data capture, payment and business tablet. It is the only manufacturer who can really focus on both Mobile computing and payment industry at the same time. 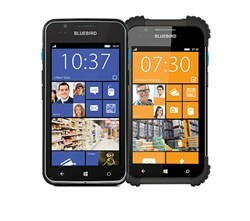 Bluebird is a premium supplier who can integrate Windows Embedded 8 Handheld in the market place. Headquartered in Korea, Bluebird operates local offices in US and China. To learn more, visit http://www.mypidion.com.